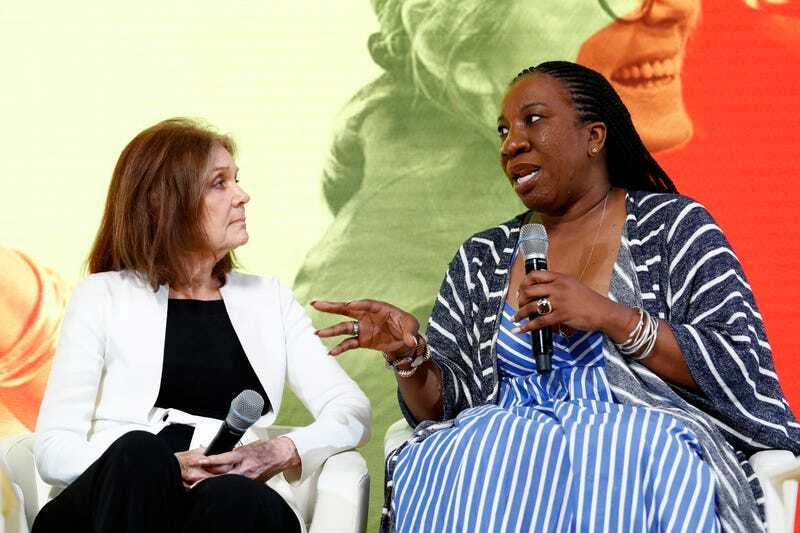 Gloria Steinem and Tarana Burke speak on stage at the IPG’s Women’s Breakfast At Cannes Lions on June 20, 2018 in Cannes, France. #MeToo movement founder Tarana Burke never ceases to amaze, and last week, she amazed the advertising crowd gathered for the 2018 Cannes Lions International Festival of Creativity, appearing alongside fellow feminist icon Gloria Steinem for global marketing organization Interpublic Group’s (IPG) eighth annual Women’s Breakfast. This year, at IPG’s Cannes breakfast, we celebrate sheroes who have changed the world through their outstanding accomplishments plus their perseverance and passion. These are women who have broken through cultural, racial and gender stereotypes, who have helped stamp out bias and establish new norms. Through their accomplishments and our own work, we can more fully understand the role of our industry in helping to establish cultural norms through the work that we do as we strive to ensure that all women are included and represented both in the creation of our work and what we produce for the marketplace. Themed “Women at Work,” the program celebrated the sheroes in our midst, including Muslim-American Olympic fencer and 2017 Barbie Shero model Ibtihaj Muhammad, and Burke, who joined Steinem on stage to discuss how the advertising industry should respond to #MeToo in its portrayal of women. It is a watershed moment because it’s now majority consciousness, at least, and women are being believed … more than any other time in my life. So it is a watershed moment, but it depends on what we do every day. Revolutions, social change, they’re like trees, they do not grow from the top, they grow from the bottom. So, just little things...if a man comments on your appearance, comment back. It’s the power to define. We are at an inflection point for our industry. There is potential for substantive progress thanks to efforts like Times Up Advertising and the #MeToo movement. ... We want to ensure that our industry is well-informed so that we can take proactive steps to ensure no one from a diverse background—male or female—is left behind. Last year we presented global research showing that only straight White women from the US see gender as their primary marker of identity and that there was a relationship between intersectional identities and perceptions about feeling included in women’s initiatives and benefitting from them. Gloria and Tarana not only bring multidimensional perspectives on the history of feminism and civil rights movements, but also on what is in motion today and views on what needs to happen. I think authenticity is so key, especially in this time, and it just feels like if you’re creating something that you don’t wholeheartedly believe in, then don’t do it. There’s no purpose. If it feels like you’re riding a wave or there’s a trend and you feel like you need to hop on it and there’s no degree of earnestness or absolute care, then hop off. ... but tell the truth in everything that you do.